While eaten as a component of cuisines a world apart, roti and whole wheat flour tortillas are nearly identical. These flat breads serve as both a utensil for grasping food and as a wrap for eating it, and are quick and simple to prepare. You can make your own roti or whole wheat tortillas in less than an hour, so you can enjoy them the best possible way -- freshly made. What differentiates roti and whole wheat tortilla is that they each contain different fats to lend smoothness to the dough. 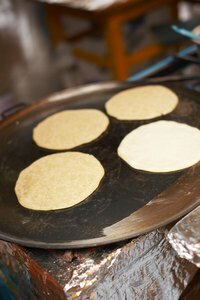 Whole wheat tortillas use lard or shortening to create their silky and smooth texture, while the slightly rougher roti dough relies upon vegetable oil, canola oil -- or no oil at all. In a pinch, and because of their close similarity, whole wheat tortillas or roti can be substituted for one another with little discernible difference. Served widely in Mexican cuisine, whole wheat tortillas range in size from 6 to 10 inches in diameter and are used to wrap both tacos and burritos. Make whole wheat tortillas with four simple ingredients -- whole wheat flour, salt, vegetable shortening or lard and warm water. Combine the salt and whole wheat flour with the shortening or lard until it incorporated and slowly pour the water in, mixing as you go. Knead the dough for three to five minutes until it is smooth. Working quickly, divide the dough into balls the size of a golf ball and cover with a towel for 30 minutes to rest before rolling and cooking. Roti is just one of several different types of flat bread used in Indian cuisine, but also one of the most simple. Make roti by combining whole wheat flour with salt in a bowl, drizzling the mixture with oil and adding in warm water while stirring the dough as you go. Once the dough holds together, knead it for two to three minutes until it becomes smooth and the same consistency as tortilla dough. Divide the dough and roll it into golf ball-sized portions. Let the dough rest for at least 15 minutes on the counter before rolling and cooking. After the dough rests, the steps for creating roti and whole wheat tortillas are the same. On a lightly floured surface, roll out each dough ball until it forms a 6- to 7-inch circle. Turn the balls several times as you roll in order to achieve a well-rounded circle. Roll all of the dough out, separating each layer with wax paper or parchment paper to prevent sticking. Heat a cast iron or non-stick skillet over medium-high heat and place each tortilla or roti in it for 30 to 45 seconds on each side or until it gets spotty brown. Remove the flat bread from the pan and cover it in aluminum foil until serving time.